Our biggest and best whipped cream dispenser! 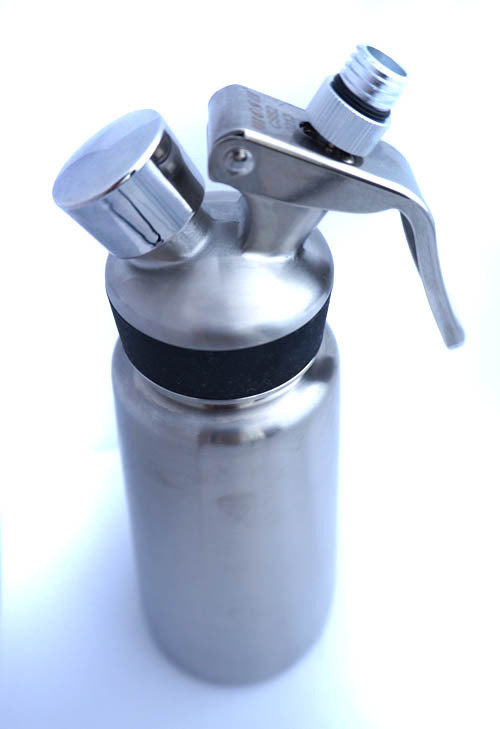 This whipped cream dispenser is designed and constructed to the exacting standards of the catering trade. 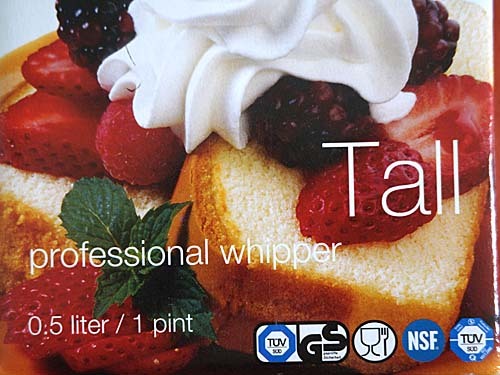 If you are a catering professional buying a cream whipper system the you can be assured that our professional stainless steel whipper will help you comply with the Food Standard Agency’s (FSA) stringent HACCP rules. Most notably it can be completely dismantled for cleaning and maintenance. For non-professional use then this product will give a lifetime of service. The stainless steel dispenser body and charger holder look amazing too – so if you own one of these it will compliment any modern kitchen. A big bonus of the professional whipper system is that it can hold both hot and cold ingredients giving you the flexibility to prepare gourmet mousse and espuma as well as luxuriant whipped creams. Many of the recipes we recommend require the use of hot ingredients in their methodology – this dispenser will give you the ability to try them out. We are all aware of the desserts that can be wonderfully enhanced just by adding whipped cream but it does not end there. Many main courses that could otherwise become boring can benefit from just a small amount of whipped cream to add to the taste and appearance. Essential additions to any kitchen are a whipped cream dispenser and a whipped cream chargers. With these appliances in a kitchen, whipped cream can be produced in a very short time and the results are always satisfactory. A perfect fluffy consistency can be obtained every time this type of cream is made. Not only do these results enhance the meal table but hot drinks can be topped with whipped cream and so can cocktails with equally favourable outcomes. Some years ago, mealtimes became a chore and there were a limited amount of ideas that were determined by a tight household budget and a lack of choice. Since then we have all been inundated with many ideas by way of cook books and television programmes. This has brought about drastic changes in the way we eat and the variety of food that is at our disposal. Although this is the case, we tend to spend less time in the kitchen. Fast food is the order of the day but with this, comes the health risks that can result in serious illness. For this reason, it is essential to ensure that the family eats healthily and to ensure this happens; housewives and mothers have to make sure that as well as the taste of food, those preparing it should also concentrate on its appearance. “We eat with our eyes” is a phrase that is often used and a colourful meal topped with whipped cream can be pleasing to the fussiest of eyes. Owning a whipped cream dispenser and whipped cream chargers gives a cook the advantage of being able to change the appearance of any meal. Children are sometimes the most difficult to cook for but even with a bowl of tomato soup a small amount of whipped cream placed in the middle, will have children queuing up for more. With a little imagination, a normal dessert can become an amazing one and desserts such as pancakes, trifle, meringue, cheesecake, even an average apple pie, can be further improved by a portion of whipped cream being added. For the main course, a casserole having a dash of cream in it as it is served can make a great difference and the texture of a curry can also be changed if cream is added. The possibilities are endless and with a little thought, a very high percentage of the meals that you eat can benefit from this simple addition.